Learn about the different types of vertigo that divers experience and how they can be avoided. Anyone who has ever experienced the feeling of vertigo will surely agree with Bono’s words in the U2 song, Vertigo. The word “vertigo” is derived from the Latin word vertere which means “to turn”. It is a specific kind of rotational dizziness in which an individual experiences the sensation that they or their surroundings are moving, whirling or spinning in the absence of actual movement. They may also suffer from light-headedness, confusion and a loss of balance. “Giddiness” is a term frequently used when trying to describe what one is feeling. Vertigo may be accompanied by nausea, vomiting and even tinnitus (ringing in the ear) or hearing loss. Uncontrolled eye movement can be observed on close examination. Vertigo is a normal phenomenon following actual spinning, like after getting off a merry-go-round. Once the body has come to a standstill, the fluid in the semi-circular canals of the inner ear continues to move, which causes a mismatch between what your eyes are seeing and the internal sensory input. The lack of a stable visual reference point also adds to this effect. Vertigo is usually associated with various disorders that affect the balance organs of the inner ear or the vestibular nerve, which carries signals from the balance organs (for example Ménière’s disease, benign positional paroxysmal vertigo, ear infections and vestibular neuronitis) or the centre of the brain that receives the signals (strokes, head injuries and degenerative illnesses). Other causes of vertigo include concussions, migraines, alcohol or drugs. An unequal response by the balance centres to the same external stimuli. Some of the different causes of vertigo experienced in the diving environment are discussed below. This is a transient form of vertigo that is experienced mostly due to the unequal vestibular stimulation by cold water. On immersion, cold water usually enters both ears symmetrically. However, if cold water enters only one ear canal or if one eardrum is perforated causing more direct stimulation of that ear, it can bring about vertigo. One-sided ear canal obstructions can be caused by one of the following: poor-fitting asymmetric hoods, a lump of ear wax, swimmer’s ear, bony outgrowths in the ear canal, or even foreign bodies, such as ear plugs or an air bubble. The perforation of the eardrum is a brief but dramatic cause of significant vertigo. Following a “pop” or a sharp, stabbing pain in the ear, cold water rushes into the ear and is immediately followed by vertigo. As soon as the water warms to body temperature, the stimulus is removed and the giddiness subsides. In the diving environment, the three major predisposing factors that cause tympanic membrane perforation that lead to vertigo are middle-ear barotrauma of descent, forceful auto-inflation of the middle ear and shock waves (such as falling onto the ear when entering the water from a boat or with the discharge of explosives in the water). Alternobaric vertigo (ABV) is a common cause of vertigo which accounts for about 60% of vertigo in divers. Ironically, it is more evident in experienced scuba divers. ABV occurs mostly on ascent (block-version) but can also be experienced during descent (squeeze-version). With a change in depth comes a change in pressure in the middle ear air spaces. Thus, when one ear equalises normally and the other one fails to equalise at the same rate, there is an inequality of pressure across the inner ear, which sends a confusing signal to the brain and causes vertigo. A sudden ascent or bolting to the surface due to panic will only worsen the effect as it increases the asymmetric pressure difference (block-version). The best way to cope with this pressure difference is to stop, descend slightly, hold on to a steady object and focus on a fixed point and then wait for the pressure to equalise. Equalising techniques should not be attempted as it may worsen the problem. Symptoms usually resolve within seconds, but they may last up to 10 minutes. Although not dangerous in itself, ABV is hazardous if it causes panic followed by an uncontrolled ascent or inappropriate behaviour, nausea and vomiting with the risk of aspiration, disorientation with trouble navigating (especially in cave or wreck diving) or drowning. Inadvertent descent when experiencing ABV may also lead to ear barotrauma if equalising measures are then neglected. To avoid ABV, do not dive when feeling sick or congested or immediately after an upper respiratory tract infection or cold. Never force air into the ears. If you have had previous encounters with ABV, avoid diving when the insides of your ears are feeling “sticky”. Remember to ascend and descend slowly and to equalise early and often during a descent. It is important to consult a diving medical practitioner before diving if you have a history of Eustachian tube dysfunction, serious middle ear infection or swimmer’s ear. One of the causes of vertigo that is harder to treat is an inner ear bend or decompression sickness (DCS), although, fortunately, this is rare. It is more common in technical or commercial diving, especially following deep dives using helium as a breathing gas. Helium is associated with the counter-diffusion of gases, which plays an important role in the development of inner ear DCS. It may, however, also be present in air scuba diving following a rapid ascent after a long bottom time and may also be accompanied by other manifestations of DCS, particularly mottled skin rashes. The vertigo is usually delayed and only starts after the decompression has stopped or when the person is on the dive boat. It also lasts a lot longer and will continue when the person is back ashore. Sensorineural hearing loss may also be present. Initial management is the same for all cases of DCS: It starts with the administration of 100% oxygen and (unless the diver is vomiting and it may compromise his or her airway) plenty of non-alcoholic isotonic fluids as he or she is transferred to the nearest chamber for recompression. It is very important to distinguish between inner ear barotrauma and inner ear DCS when making the diagnosis, as the management of these two conditions differs completely. This can sometimes be tricky and difficult and a thorough history and examination by a practitioner who is experienced in diving medicine is essential. Barotrauma of the external, middle and inner ear, and the forceful auto-inflation of the middle ear, can all bring about vertigo. This is more likely and severe in the upright position. The inability to equalise the middle ear space may produce unequal pressure gradients with vestibular confusion and may result in vertigo (similar to ABV). Alternatively, the forceful auto-inflation of the middle ear may cause the inner-ear membranes to rupture and may even cause fluid leakage due to a round window rupture. Vertigo, ringing in the ear and hearing loss after a no-decompression dive should alert to possible inner-ear barotrauma and requires urgent evaluation by a specialist for medication in order to preserve hearing and for the possible surgical repair of the fistula. Because of the interference with cerebral functioning, various gas toxicities may cause sensory disturbances, including vertigo. Nitrogen narcosis, usually experienced when breathing air at depths beyond 30 m, can cause dizziness that may mimic or even contribute to vertigo, especially in conjunction with a dysbaric or caloric stimulus. On the other hand, high carbon dioxide (CO2) levels can lead to disorientation which may be confused with vertigo. A sudden reduction in high CO2 exposure may, however, also cause vertigo due to the CO2-off effect. Vertigo is also a well-known warning symptom of central nervous system oxygen toxicity. It is seen most commonly when divers use oxygen, gas mixes or rebreathing equipment and when the recommended safe oxygen exposures (oxygen time-pressure limits) are exceeded. Furthermore, high pressure neurological syndrome (HPNS) is seen in commercial divers. It is provoked by rapid compression and is characterised by vertigo, nystagmus, nausea and tremors. Other gas issues such as hypoxia (due to breathing mixture or rebreather problems), hyperventilation (or hypocapnia) and carbon monoxide poisoning may all present with the onset of vertigo due to the disturbance in the level of consciousness. A lack of sensory input, especially spatial orientation signals, is likely to cause vertigo. An example is the fear of heights that is experienced by some scuba divers, causing dizziness when looking down into deep waters. This can be overcome by focusing on an object in the level plane of vision and by swimming along ledges, the seabed or the surface. 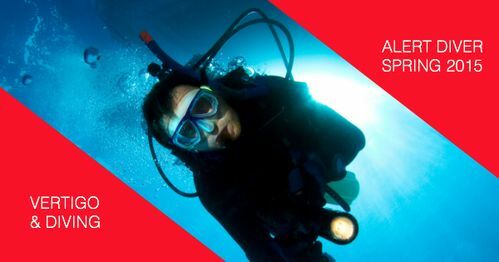 Due to a disproportionate and unequal vestibular response to motion, some divers can suffer from nausea, vomiting, vertigo and even fainting on the dive boat or while decompressing during safety stops or even swimming. The Tullio phenomenon is a fascinating, albeit rare, occurrence of vertigo due to the exposure to loud noises. It has been observed in compression chambers without muffling systems over the air inlets, in helmet divers, in caisson workers and in aircrews. The most pronounced version is associated with a hernia (superior semi-circular canal dehiscence) of one of the semi-circular canals of the inner ear. This bulge permits abnormal fluid shifts in the presence of pressure of a loud sound, thus provoking vertigo. The condition usually requires surgical repair. Whatever the cause, vertigo in the diving environment is potentially hazardous and should be managed calmly and quickly. A controlled ascent is required with protection of the airway, if vomiting occurs. Unless it is transient (less than 10 minutes with no other symptoms related to the ear or otherwise), suspend further diving until a diving medical practitioner has been consulted. Treatment is mostly symptomatic and includes bed rest and sometimes drugs like antihistamines, topical decongestants, steroid sprays or antibiotics. Recompression is the treatment of choice for DCS but, if inner ear barotrauma is suspected, referral to an ear, nose and throat specialist is required. Edmonds, C., Lowry, C., Pennefather, J. & Walker, R. Diving and Subaquatic Medicine. 4th edition. And then there is the one that hit me, and is unlikely to be any of the above.I has a sudden attack of severe vertigo complete with nausea about half an hour after surfacing from a dive on Nitrox, way inside the no decompression limits, with a slow ascent, and long safety stop, I boarded the boat with no problem, my ears could equalise easily at all times before, during and after the dive. We had a fairly short but very bumpy ride back to shore to swap out divers and cylinders for the second dive, and while preparing to leave the slipway I suddenly was overcome by vertigo, which got worse over a couple of minutes, so I told the skipper to drop me off. While wading ashore I lost all balance and was violently ill while hanging on to the jetty fenders. The shop transport took me back to the shop, called an ambulance, phoned DAN and got me out of my suit. Movement severely aggravated the vertigo, lying still helped some. I was transported to the mediclinic, tested for various things, x-rayed , given a drip and anti-nausea meds and it dissipated over the next couple of hours so they discharged me as they could find nothing to explain the vertigo and nothing else significantly wrong. I noticed that head rotation on two axes was normal, but on th transverse axis it felt like there was sideways movement at bout 45 degrees. There was slight nystagmus. I interpret this as a problem in one semicircular canal. The symptoms cleared up entirely over the next couple of days. Two weeks later I went for a dive to see if anything would happen, and there was nothing that I could notice. No recurrence after nearly 6 months. Jack Meintjies thinks it may have been a loose otolith throwing my ear into confusion. This is plausible considering the history, particularly the unusually rough ride after the dive. I exclude seasickness as I have not been seasick since 1987, and have lived on boats at sea for months at a time in much rougher weather, and the motion was not a particularly nauseating one, more banging on short chop. Also it hit me in calm water and persisted on land.